Events — Beef Empire Day's Inc.
Finney County Fairgrounds 6:00 p.m. The carnival runs Friday, May 17 through Sunday, May 26 at the west end of the Finney County Fairgrounds. They will open daily at 6:00 p.m. Listen to the local radio stations for announcements on special wristband promotions and weather related closings. Garden City Arts- 12:00 P.M.
Come to Downtown Garden City Arts to see great art by local artist Deb Huber! Deb is Beef Empire Days’ featured artist this year; she painted several pieces that have been spotlighted throughout our advertising. Those pieces along with others will be on display throughout Beef Empire Days. If you are interested in purchasing any of the pieces or have questions contact Katy Guthrie at 620-260-9700 or gardencityarts@gmail.com. Saturday, June 1st- Garden City Arts- 10:00 A.M.
Tuesday, June 4th- Garden City Arts- 12:00 P.M.
Wednesday, June 5th- Garden City Arts- 12:00 P.M.
Thursday, June 6th- Garden City Arts- 12:00 P.M.
Saturday, June 8th- Garden City Arts- 12:00 P.M.
– Finney County Public Library, Nature Explore Garden, 2:30 p.m. Some of the most alluring places are found not only on stage with a magician but even more in the universe of books, where readers are whisked away into infinite worlds of enchantment, discovery and learning! Magicians, “Mr. E” and Kyle Groves, have been entertaining audiences for many decades, captivating them with mystery, magic, comedy and wonder. In the process, they hope to imbue everyone - from kindergartners to adults - with a thirst for reading and learning. Come join us for this free event that kicks off the summer reading program at Finney County Public Library. 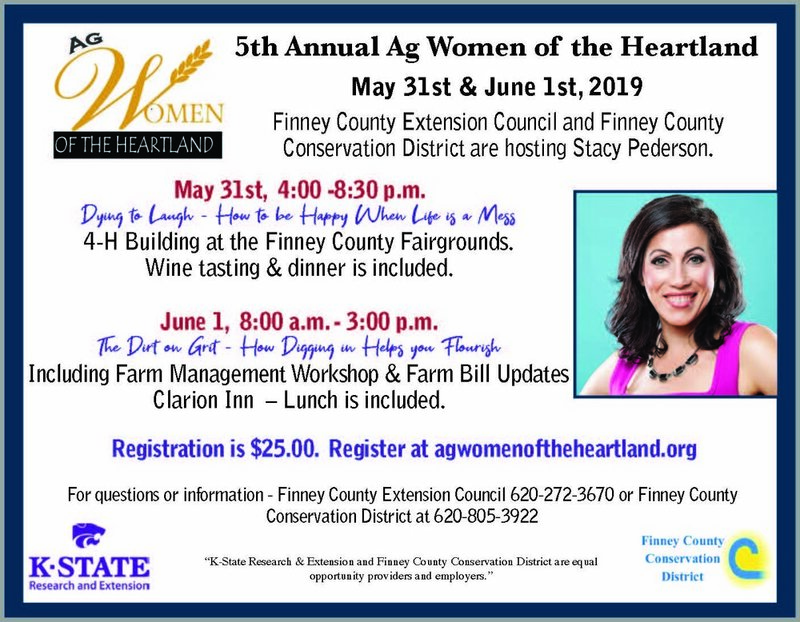 -Finney County Fairgrounds, 4:00 p.m. – 8:30 p.m.
Finney County Extension Council and Finney County Conservation District are hosting the 5th Annual Ag Women of the Heartland. The event will be held on May 31 from 4:00p.m.-8:30p.m. at the 4-H Building located at the Finney County Fairgrounds. The night will begin with wine tasting followed by dinner and special guest Stacy Pederson presenting “Dying to Laugh – How to be Happy When Life Is a Mess”. The event will continue on June 1 from 8:00a.m.-3:00 p.m. at the Clarion Inn, with lunch included. Stacy Pederson will be presenting “The Dirt on Grit – How Digging in Helps you Flourish” followed by Farm Management Workshop and Farm Bill Updates. Registration is $25.00. Register for the event at agwomenoftheheartland.org. For questions or information contact Finney County Extension Council 620-272-3670 or Finney County Conservation District at 620-805-3922. 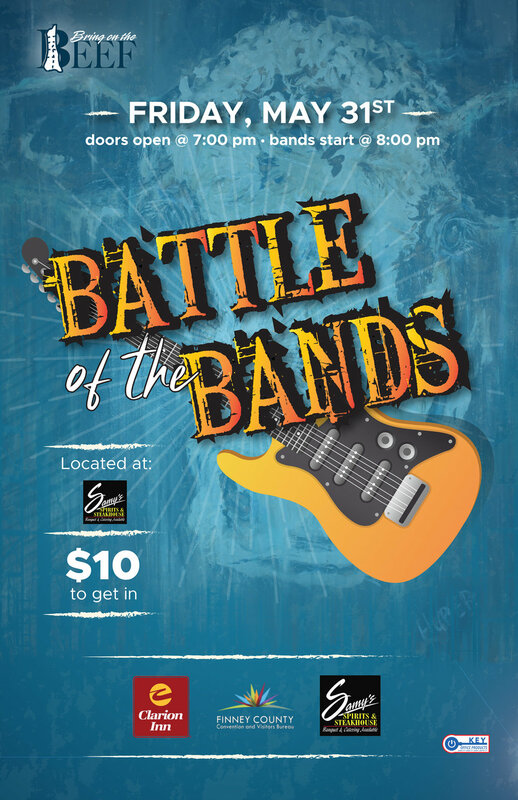 Samy’s Spirits & Steakhouse - 7:00 p.m.
Come KICKOFF the 51st year with Battle of the Bands!!! This good time will feature area bands in the parking lot of Samy’s. The night will be filled with live music and 51 years of celebration! Doors open at 7:00pm with bands starting at 8:00pm. $10.00 to get in with tickets being sold at the Clarion Inn. Get your tickets NOW!!! The Garden City Municipal Band, founded in 1879 (along with the City of Garden City) is celebrating its 140th Concert Year! Join the Band in Steven’s Park on Friday, May 31, at 7:30 P.M. and Friday, June 7, at 7:30 P.M. for a “Concert in the Park”. Highlights include a children’s flag march and celebration of audience birthdays! Come join the Band for an evening of entertainment and fun! – YMCA – 7:00 a.m.
– Peebles Complex – 10:00 a.m. The Beef Empire Days Softball Tournament will have men’s, women’s and coed divisions. It will be a 4-game guaranteed tournament. Game balls will be provided. Cost of tournament is $180. Entry information is available by contacting the Garden City Recreation Commission at (620) 276-1200. – Finney County Fairgrounds – 5:00 p.m.
– Finney County Fairgrounds – 7:00 p.m.
- Christian Music Concert- Stevens Park – 7:00 p.m.
– Finney County Fairgrounds- 10:00 a.m.
~ Finney County Fairgrounds, 9:00 a.m. The cattle begin arriving at dawn or before and the excitement level will peak by mid-morning when the 51st annual Live Show takes center stage. Anyone with an interest in the cattle feeding industry is invited to be in the grandstands at the Finney County Fairgrounds at 9:00 a.m. when Live Show Judge Blake Bloomberg will begin the final judging of the top steers and heifers. A big thank you to Merck Animal Health for their continued partnership. Dr. Blake Bloomberg is an Assistant Professor of Applied Animal Science at Oklahoma State University. Blake and his wife, Wravenna, have four children. A daughter Breckyn, twin boys Brenhem and Berwick and a son Bexton. Blake was raised in Berwick, IL on his family’s diversified livestock operation that consisted of cattle, hogs and row crops. Dr. Bloomberg currently serves as the Livestock Judging Coach at Oklahoma State University. During his career, Blake has coached the National Champion Livestock Judging Team in 2017 and 2018 and Reserve National Champion Livestock Judging Teams in 2009, 2014 and 2015. Blake was named the 2008, 2009, 2014, 2017 and 2018 National Collegiate Coaches Association Coach of the Year. He also serves as co-coach of their Meat Animal Evaluation Team with Dr. Gretchen Mafi that were the National Champion in 2011, 2014 and 2015 and Reserve National Champion in 2010, 2016, 2017 and 2018. Blake attended Black Hawk East Jr. College and was a member of the 2004-2005 judging team that was defeated only once. He was the High Point Individual at the 2006 National Intercollegiate Livestock Judging Contest and was also a member of the 2006 National Champion Livestock Judging Team for Texas A&M that was undefeated in competition. Blake has judged livestock shows in 42 states and 3 foreign countries including events at the American Royal, North American International Livestock Exposition, National Western Stock Show, Houston Livestock Show and Rodeo, San Antonio Livestock Show, and several regional and state events. Special thanks to our friends from LBS Scales who provide the weigh chute and scales for the Live Show and to Troy Consbruck of TLC Trucking for their assistance in transporting the Live Show cattle to Tyson Fresh Meats. – Finney County Fairgrounds Grandstands – 12:00 p.m.
“Can you beat the Judge?” Public Pick 5 is open to men, women and youth. Each person will pick five head during the steer division of the Live Show that they believe will be the top placers in the Beef Empire Days Index during the carcass show. The total of the Beef Empire Days Index of your five head will determine the winners. Cost is $20 per person to enter the day of the show. The top three winners of the men’s and women’s divisions will be awarded. The youth division winner will receive a nice duffel bag. A special thank you to Alltech for their sponsorship. Show and run until 6 p.m. It will include drinks and light appetizers. To register, visit kscorn.com/events or call 785-410-5009. – Clarion Inn – 6:00 p.m.
- Clarion Inn – 8:30 p.m. The People's Choice Auction includes the top 25 placing heifers of the live show. The objective is to select the heifer with the highest BED index score. The top three heifers based, on the BED index score, will be awarded. Participants and buyers alike are invited to join in on the fun–filled evening at the Clarion Inn. – Irsik & Doll Feedyard – 11:30 a.m. The Beef Empire Days Cattle Working Contest is open to all area processing crews and provides an excellent opportunity to learn the newest trends and test the latest equipment. The event begins at 11:30 a.m. at Irsik & Doll Feedyard. All participants will receive lunch and have the opportunity to visit different vender booths from the industry and learn about the products and equipment they use on a daily basis. Entry forms are available at www.beefempiredays.com or by contacting the Beef Empire Days office. The Cattle Working Contest is coordinated and made possible by the following sponsors: Animal Health International, Bayer, Elanco and Temple Tag, Ltd.
–Finney County Public Library – 10:30 a.m.
United Wireless Community Children’s parades gives small children the opportunity to walk, ride bikes, strollers, scooters or trikes and participate in a parade like setting that includes prizes and free give aways for all who participate. Children 12 and younger are invited. This event is free to everyone and there is no entry fee. Information is available by calling the Finney County Public Library at 620-272-3680. This event is made possible by United Wireless. - Tyson Plant – 2:00 p.m. The Carcass Show will take place at 2:00 p.m. You are invited to view the carcasses. The Beef Empire Days, Inc. Board of Directors would like to say “thank you” to Tyson Fresh Meats and their staff for their contribution to the continuing success of the Beef Empire Days Carcass Show. Gretchen Mafi is a Professor and the Ralph & Leila Boulware Endowed Chair in the Department of Animal Science at Oklahoma State University, where she conducts research and teaches undergraduate and graduate courses in meat science. Gretchen earned her bachelor’s degree in 1994, from Texas Tech University, a Master of Science degree in 1996, from Colorado State University, and a Ph.D. in Animal Science with emphasis in meat science in 2000, from Texas Tech. Gretchen joined USDA-Agriculture Marketing Service as a meat marketing specialist in 2001. In August 2002, she accepted an assistant professor position at Angelo State University in San Angelo, TX. In 2006, Gretchen began as an assistant professor in Meat Science at Oklahoma State University. Gretchen’s love and passion for teaching make her career choice in academia obvious. She teaches three meat science courses each semester at OSU, along with her advising and research responsibilities. She conducts research in the area of meat cutability and quality, with over 60 published articles in scientific journals. Also, Gretchen coaches the Oklahoma State Meat Judging Team and Meat Evaluation Team. She also plays a vital role in extension at OSU coordinating meat judging contests and providing support for other programs and activities on campus and around the state. She is actively involved in the American Meat Science Association, serving as a member of the Board of Directors from 2014-2017, a leader of several committees and served as the AMSA Intercollegiate Meat Coaches Association President in 2010-11. Gretchen received the Merrick Foundation Teaching Award for the American Free Enterprise System awarded by Oklahoma State University in 2015, as well as the Award of Excellence in Teaching from the OSU College of Agricultural Sciences and Natural Resources. She also received the American Meat Science Association Achievement Award in 2007. Gretchen and her husband, Jeff Mafi, reside on their farm in Coyle, OK, raising purebred Angus Cattle. Garden City Arts (multiple locations)- 4:00 P.M.
For any questions contact Katy Guthrie at 620-260-9700 or gardencityarts@gmail.com. 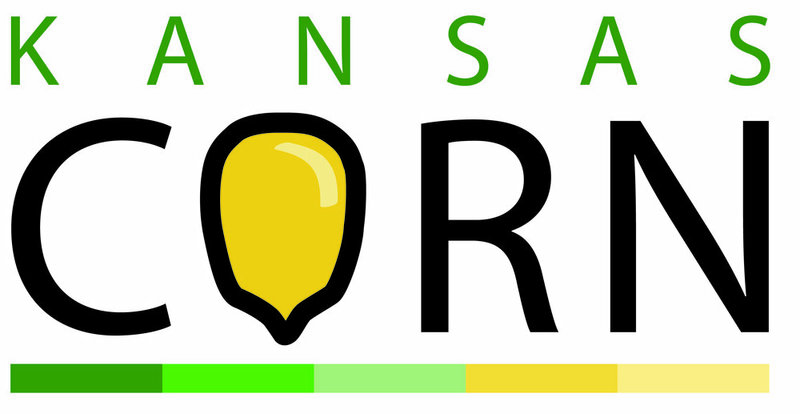 Thank you to our sponsors Adams Real Estate and Knoll Crop Production. - Clarion Inn, 6:00 p.m. The social Hour begins at 6:00 p.m. at the Clarion Inn Ballroom, immediately followed by the awards banquet. Guests will be served succulent Western Kansas beef and all the trimmings. Then, the excitement begins as the Live and Carcass Show awards are presented, as well as awards for the Cattle Working Contest, People’s Choice Auction, Public Pick 5, Ranch Rodeo and the Mary M. Hopkins Award for Volunteer Service. In addition, the Beef Empire Days Academic Scholarship recipients will be recognized along with the Southwest Kansas Cattle Women academic scholarship winner. The Awards Banquet is sponsored by American AgCredit and Zoetis. Meat provided by Tyson. Sam Hands, Garden City, Kansas, is the 2019 Beef Empire Days Mary Hopkins Award recipient. A fourth generation cattleman, Sam began his career in the beef industry in 1957 purchasing 12 bred Angus heifers with his dad, Fielding. As a vocational agriculture student, he expanded his herd as a custom caretaker for a young registered Angus breeder. While at Kansas State University, Hands served as a State FFA Officer and received the American Farmer Degree. He was a member of the meat, wool and livestock judging teams, Alpha Gamma Rho fraternity and Block & Bridle. After graduating from K-State in 1970, Sam served two years as a Lieutenant in the U.S. Army with a tour in Vietnam before returning home to join his father’s operation. He partnered with his two brothers, Greg and Cedric, to establish Triangle H Grain & Cattle Co. Over the years, the operation has grown to include irrigated crop production, a cow calf operation and two feedyards. Cattle are primarly marketed through U.S. Premium Beef that they invested in as a founding member. Hands has been an industry leader, serving as Beef Empire Days and Finney County Farm Bureau president. He was one of the original six delegates on the Cattleman’s Beef Board to develop the Beef Checkoff program and served as vice chairman of the Kansas Beef Council. Sam served as chairman of the KSU LMIC and is now on the LMIC Royal Board, the State FFA Foundation Board and Finney County Economic Development. In 1978, Sam was named the Farm Bureau Young Farmer and Rancher of the Year. He has received the LMIC Stockman of the Year Award, BIF Commercial Producer of the Year Award, Honorary Member and Outstanding Stockman from the KSU Block & Bridle Club, KSU ASI Distinguished Alumni Award, Honorary Finney County 4-H Alumni Award and was made an Honorary Chapter Farmer of the Garden City FFA. Sam and his wife, Janet, have three children – Marisa, Quincy and Rebecca — and three grandchildren. Garden City High School Auditorium-7:00 p.m.
William Shakespeare’s famous tragedy of Hamlet, the Prince of Denmark. GCHS’ encore performance will be presented free of charge at 7 pm in the GCHS Auditorium. Good will donations will go towards the students’ trip to perform at the International Thespian Festival. Hamlet was selected as one of eleven productions that will perform at the International Thespian Festival June 24th-29th in Lincoln, NE. This is one of the most prestigious honors that a theatre program can have as GCHS students will perform for thousands of theatre students, colleges, and professionals from around the world. Hamlet is a free performance. Hamlet is a free performance. – Stevens Park – 6:30 a.m. The friendly bankers and associates at Commerce Bank invite everyone to Stevens Park in downtown Garden City beginning at 6:30 a.m. for pancakes and beef sausage. The chef from Chris Cakes will be flipping pancakes onto your plate (and into the audience) until 9:30 a.m. It’s all- you- can-eat chuckwagon grub for only $3.00 at the event. All proceeds will be donated to Leave a Legacy. Please contact Donna Tanner at (620) 276-5711 for more information. Event brought to you by Commerce Bank. – MainStreet – 10:00 a.m.
“Bring on the BEEF!” is the theme for this year’s annual parade. Garden City’s largest parade is sure to be a crowd-pleaser with 100 plus entries. The parade begins promptly at 10:00 a.m. For entry information visit us at www.beefempiredays.com or contact the Beef Empire Days office at (620) 275-6807. The parade is made possible by Western Motor. The 2019 Parade Marshall is the All American Beef Battalion (AABB). All good deeds require both vision and follow through. Thanks to both of those, the AABB is currently in its 11th year of saying “Thank You” to those that protect our freedom at home and rid human oppression around the world. Bill Broadie of Ashland, KS is the man with the vision. This two-time purple-heart honored Vietnam veteran believed that everyone being deployed or returning from deployment should be shown the highest degree of appreciation possible. To a cattleman like Broadie, that can be easily shown with a ribeye steak. 2019 marks the 11th year since the first steak was grilled and served with all the sides and a hand shake of thanks to the troops serving our great country. The first AABB steak feed was held in Olathe, KS, on April 26, 2008. It was served to members of the 731st Transportation Co., a National Guard unit returning from duty in Iraq. Today the number of servicemen and women that have been fed is approaching 500,000 and the count is rolling upward. There is no doubt every worthy endeavor requires a vision but something of this magnitude also requires great follow through. Countless individuals from the Great Plains region of the country have dedicated millions of hours of volunteer time to assist in sharing the protein-packed message of gratitude. This operation has truly become one of the greatest mobile catering units in the country. The volunteers have served troops from Camp Pendleton to Walter Reed hospital and most every state in between. There is no group size that is too overwhelming as the AABB has fed more than 5,000 on three different times including one such feed at Fort Carson Colorado that was served in just 1 hour and 50 minutes. While we can’t say enough about the individuals who have shown the patriotism to volunteer for this worthy endeavor, it needs to be mentioned that the cost of feeding the troops typically runs about $12/person. That money has been generously donated by families and farm commodity organizations that share the same degree of appreciation for our troops as the core group of the AABB. No matter the size of group, the AABB has been humbled by the ability to spend time with otherwise underappreciated service men and women who sacrificed to ensure that after 243 years, we still live in the greatest nation in the world to call home - the United States of America. – Lee Richardson Zoo - 11:30 a.m. Sample the flair of the west at the Lee Richardson Zoo west side in Garden City. An old-fashion BBQ meal will be served for a $1.00 a person. The beef is slow-cooked to perfection to enjoy the true flavors with all the fixings. Enjoy the true “out west” with chuckwagons, family entertainment, food, vendors and just downright family fun. Serving begins immediately following the parade at approximately 11:30 a.m. Thank you to our featured sponsors: Baker Boot, Big L Sales, First National Bank of Garden City, Klaus Wood Pellets, Tyson and United Wireless. Meat provided by Tyson. Come out to Lee Richardson Zoo and join the Kansas Kruisers car club for this 1st annual scholarship car show. This scholarship event will be in conjunction with the Beef Empire Days staple Chuckwagons at the Zoo Community Feed and follow directly after the Western Motor Beef Empire Days Parade with registration taking place at that time. All vehicles/motorcycles welcome to join! Event awards will be given at 3 pm. $20 suggested donation for all entries. All proceeds go to Beef Empire Days Scholarship fund. For more information contact Cory King at 620-521-0201 or Pete Kuneyl at 620-272-7187. - Stevens Park – 4:00 p.m.
- Stevens Park – 5:30 p.m. Beef Empire Days, Downtown Vision and Western State Bank has joined together to bring you this 2nd Annual event filled with food, beer, and music. Hero’s Way will have food trucks with signature beef dishes competing for “Beef Empire Days Food Truck of 2019”. There will be a beer garden featuring brews from our very own local brewery, Flat Mountain Brewhouse! Along with Live music from the Clay Davenport Band and the smell of steaks from the Grill Master Cook-Off. Beef Empire Days will draw winners for the Polaris Slingshot, Ruger Mini 14 Cattle Drive, and Black Rain Ordance AR15. The park will be full of people, food, music, and fun until 11:00 p.m. For more information contact Downtown Vision at 620-276-0891 or the Beef Empire Days office. Special thanks to our friends: Downtown Vision , the beer sponsor Flat Mountain Brewhouse and the event sponsor Western State Bank. – Buffalo Dunes Golf Course- 7:30 a. m.
Golf action begins on South Highway 83 on Saturday morning for the Buffalo Dunes four-person scramble tournament. Shotgun starts at 8:00 a.m. Register by calling the golf shop at (620) 276-1210. Event sponsors are: Animal Health International, Chappel Liquor, Elanco, Feedlot Magazine, Legacy Animal Nutrition. Meat provided by Tyson. Samy’s Spirit and Steakhouse - 4:30 p.m.
Once again its feedin’ time and you’re invited to a progressively delicious dining experience featuring some of the Beef Empire’s best grub served at some of the finest local establishments. Participants will meet at 4:30 p.m. at Samy’s Spirit and Steakhouse. Board the bus and the adventure will unfold. Some of the finest local restaurants will be featured. Guests will be ferried from location to location aboard their own “stagecoach”, courtesy of Garden City Community College.